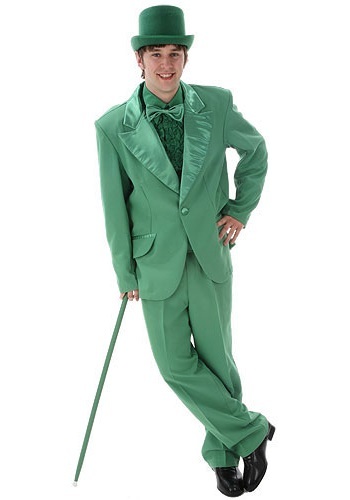 Get into character with our tuxedo costumes and rock your next formal or themed event. The tuxedo pants are polyester with an elastic waist and a satin stripe down the outside of both legs. The jacket is polyester with a satin lapel and satin trim on the pocket flaps, as well as, a satin covered button for closure. The shirt is a poly-cotton blend with ruffles along the front center and at the cuffs. Polish off the tuxedo look with the satin cummerbund and bow tie. Give the finishing touches with the cane, hat and tuxedo shoe accessories! 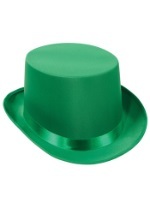 Check out Bright Colored Tuxedos .com for more information, colors and the option to purchase an Green Tuxedo.